BENAA offers purpose oriented design with all the useful features a real estate website needs. With BENAA, the admin can manages all properties and users on the backend, uses options to allow users submit their properties for free or a fee based on packages. On frontend side, users have fully features: add new propery, user profile management, save searched, compare property, add to favorite, etc. ESSENTIAL REAL ESTATE plugin is supported global payment, build market, single, list propery, single agent etc. This plugin offers completely all features, easy customize, override layout and the developers always hear feedbacks from users to update new dynamic functions that help you can build any kind of Real Estate website. FREE plugins but already all PREMIUM FEATURES. We already build 9 Pre-homepage demos are available to get you started in seconds. Build website within a seconds as easily as never before. Import whole demo content, and set up your web site to look just like any of our demo examples in One Click Install Demo Data. BENAA is Fully Responsive Design, ensure smooth user experience on all platforms, so rest assured your site will look awesome on desktop, mobile & phone. BENAA includes poweful page builder plugin – Visual Composer ($45 value for free), with ERE shortcode and BENAA shortcode built-in gives you total layout control over pages & posts. BENAA has powerful Front End Listing Submission & Management System, allow users to favorite, submit, manage and edit their listings directly from the frontend with payment support. It provides your agents and clients with an easy way to manage their profile, properties for sale and other settings. BENAA provided fully all features of user on FrontEnd side: add new propery, user profile management, saved searches, compare property, add to favorite…etc. 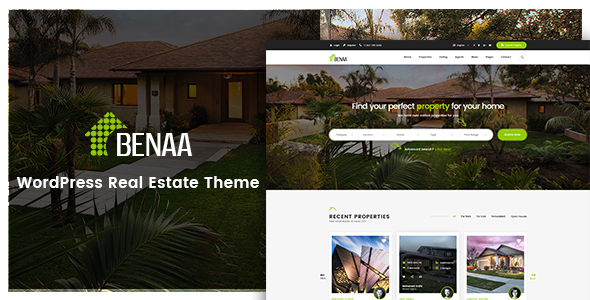 With ton of options of BENAA theme and Essential Real Estate plugins, you can build any kind of website real estate as you want. Custom built Google Maps integration with marker clusters. Enter your house address and Google Maps gives you hints in drop-down and finds location and Near Places as well. Powerful tailor made search utility in BENAA, with drag/drop panel to easily enable, dropdown/slider display, disable and reorder fields. BENAA has Favorite Properties, a user can add a listing to their favorites for viewing or sharing later via the My Listings page from their personal infor box. Estimate your mortgage payment by enter the price of the home, your down payment, and detailed interest rate in % to calculate the home loan schedule. BENAA has not only included the core set of powerful features and option, but also tons of useful shortcodes and 15+ custom widgets that can be used in the sidebars, footer and page builder. BENAA has powerful Theme Options and Real Estate Options, plethora of options neatly organized into sections that allow you to build your site without any coding knowledge. You can translate BENAA into any language, its also RTL and WPML compatible. You can change the overall typography just with some click such as font family, font size, font weight&style. Choose accent color for your website and it will change sitewide. Also you can easily change colors of each area such as Top Bar, Header, Footer etc.